A bundle of sage, three candles and a full sized Pagan Book of Days detailing Pagan holidays comes in this kit for performing a traditional house blessing. To honor the Gaelic holiday known as Samhain, we have put together a special bundle offer. If you are a practicing Wiccan or Neopagan currently practicing and observing this holiday or you are just curious to find out more, this is the right package for you. 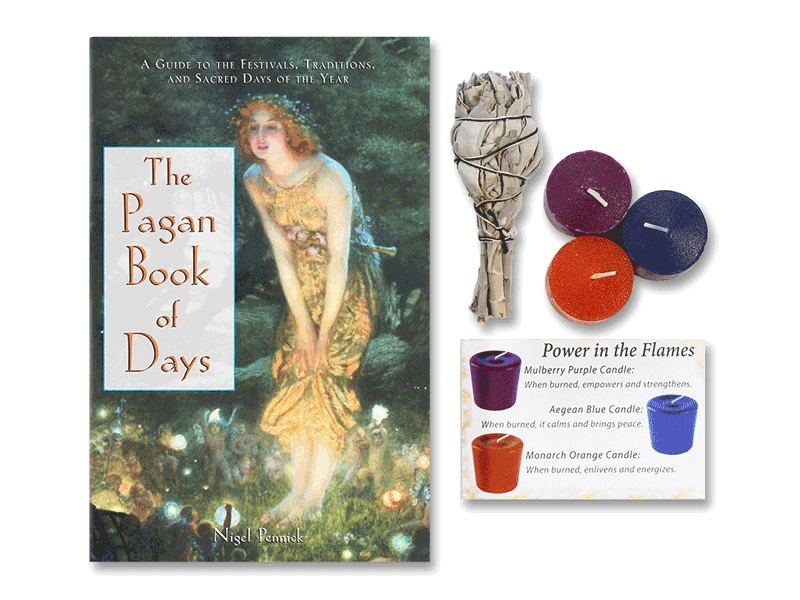 The Pagan Book of Days - it provides a detailed account of ancient holidays, eight stations in the year (equinoxes, solstices, and cross-quarter days), as well as lunar and solar charts that indicate dates of the major Pagan celebrations through the year 2033. Three ritual candles for ceremonies with their own unique properties. Monarch Orange candle is infused with the energy to enliven. Aegean Blue Candle is calming and brings a sense of peace. Mulberry Purple Candle can be burned for strength and empowerment. The sage bundle can be used for a house blessing or cleansing ceremony. It is known as smudging in Native traditions, and can be adapted to meet the need of the person or house receiving the blessing. Light the end of the bundle and then blow out the flame to let the ember smoke as you walk it around the space needing to be cleansed.